I’m not sure who coined this phrase, ‘If you Win the Morning, you Win the Day’. The first time I heard it said was by Tim Ferris. On The Tim Ferris Show podcast, Tim asks his guests what their first hour of the day looks like. This question made me reflect on how I spend my first hour of the day and how to improve it. What I found fascinating in the book besides the strategies to ‘transform your life before 8 am’ was Hal Elrod’s miraculous transformation after a devastating car accident. Hal was involved in a 3-car collision when he was 20 yrs old. One that approached his car head-on and the other smashing into the driver side door. The following is a narrative about the injuries he suffered at the point of impact. Hal Elrod was clinically dead for six minutes, but the paramedics was able to revive him. He spent six days in a coma. And after he woke up his doctor told him he may never be able to walk again. However, his unrelenting spirit and determination to press forward affected his body in a manner where he started to heal. And after seven weeks of rehab in the hospital, he learned to walk again. What ultimately helped him to full recovery? His positive mindset and practice of gratitude. I stopped putting energy into wishing my life were any different-into wishing bad things didn’t happen to me-and instead focused 100% on making the best of what I had. Such a powerful message! In the following years after his accident, he succeeded in many of his endeavors. As a sales manager, he had the highest earning sales; he finished writing a book (not this one – this book is a product of his next downfall even more painful to him than death itself! ); and became a life/business Success Coach sharing the success he had after his car accident. But for Hal Elrod, the worst is yet to come. For him, it was the financial fall-out of 2007 that crushed his life even more than the six minute death and the six day coma he experienced. After he revealed to a friend his devastating financial loss and how his life was in shambles, his friend’s simple question of ‘Are you exercising?’ caused a series of events that led him to the eureka moment from which the book Miracle Morning was born. It was one morning when Hal decided to take his friend’s advice, laced up his ‘non-running’ shoes (because he’s not a runner) and went for a run. While listening to a personal development audio by Jim Rohn, one phrase struck him. This quote was the driving force of digging himself out of a deep turmoil and became the concept of the book ‘The Miracle Morning’. Everyone can benefit from including any one of these strategies as part of your morning routine. He used the acronym SAVERS as in ‘lifesavers’ because this approach was what brought him back to life. Isn’t the morning the most ideal time to spend in silence? You’d only agree with me if you wake up earlier than anyone else in the house! Silence is synonymous to meditation, prayer, breath. Whatever it is that puts you in touch with your spiritual being. When my girls finally slept through the night, I started a meditation practice right after I awakened. I use the Calm app on my phone and try to focus on my breath for five minutes. To me, five minutes is a long time to focus when my mind constantly wanders. The beauty of a guided meditation is it reminds you to come back to the breath after you acknowledge your current thought. I think it helps me maintain my focus and use the power of breath when stressful situations arise during the day. Who believes in the ability of affirmations to instill confidence to propel you towards success? It’s what Hal Elrod learned from reading Think and Grow Rich by Napoleon Hill. It’s a book I’m also currently reading as I continue to improve my personal development. I understand how our minds powerfully influence our beliefs. If we implant a positive affirmation in our mind, we start to believe in it and eventually we become it. Affirmations have never crossed my mind until recently, after reading this book as well as Napoleon Hill’s. You can use affirmations to start programming yourself to be confident and successful in everything you do, simply by repeatedly telling yourself who you want to be, what you want to accomplish and how you are doing to accomplish it. With enough repetition, your sub-conscious mind will begin to believe what you tell it, act upon it, and eventually manifest in your reality. A week before a race (half or full marathon), I spend time to visualize running on specific parts of the course. How I would approach a hill. Or what my posture will look during the last few miles of the race. Even what my finish line photo would look like! Honestly, this is the one approach I don’t do first thing in the morning. I don’t think about it usually, but I can see how effective it could be paired with the affirmation. To see yourself achieve goals and conquer adversity in different areas of your life. Like affirmations, it’s a great enforcer of belief. My favorite! Lately, with Chicago Marathon a couple of weeks away, I’ve spent the first hour of the morning either running on the treadmill or in the pool running. The days when I don’t I usually do at least 10 minutes of movement, targeting the five functional movements – push (push-ups), pulls (rows), bend and lift (squats, deadlifts), single leg (lunges), rotational (med ball chops). Any type of movement helps to improve your cognitive function with more glucose and oxygen to your brain. It literally wakes up your brain! Movement also immediately enhances your energy and sets you up for a productive day. Reading is the fast track to transforming any area of your life. It is one of the most immediate methods for acquiring the knowledge, ideas, and strategies to achieve Level 10 success in any area of your life. Couldn’t agree more! I think reading is the most inexpensive and best investment to success. I loved to read ever since I was a kid. When I lived in the Philippines, my mom purchased two sets of encyclopedias. 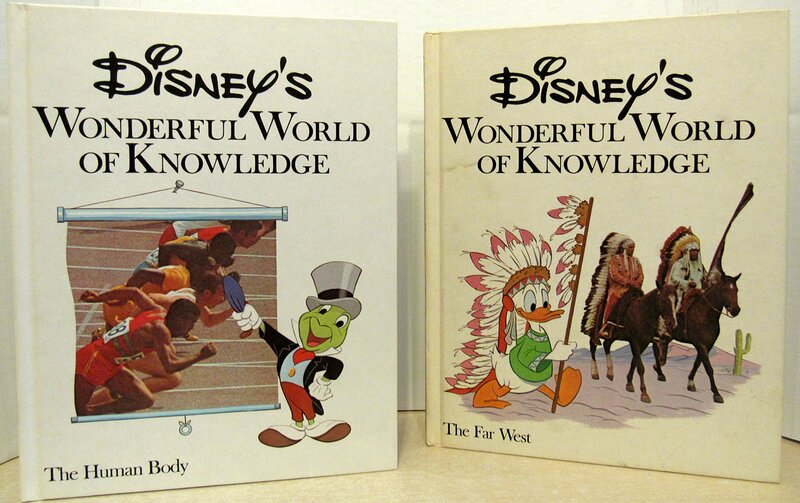 One was particularly for kids, Disney’s Wonderful World of Knowledge. How I loved paging through those books. Photo credit to amazon.com My favorite was The Human Body. There’s an illustration of what happens to food after swallow it! However, I can’t get into the habit of reading in the morning. I usually set aside time for it during the day or before bed. I can see the advantage of reading in the morning, in case you have a busy day ahead, then it’s something you’ve already done. Finally, the last one is Scribing or Writing. This could take the form of journaling, jot down ideas or even write your first book! I’m big on journaling. In fact, I have a journal dating back to 1989. Now I like to divide my journal into three sections – Health, Wealth, Wise on the front page and a Gratitude + Affirmations on the back page. For example in the Health section, I like to track my hours of sleep, movement (types of exercise, # of steps, # miles ran), if and how long I meditated and the type of meals I eat throughout the day. I finish my journal entry before I go to bed. So what I write in the morning is my affirmation. Sometimes I’d write under the Wealth section one to three things I truly want to focus on that will contribute to my success. Do you think it’s possible for you to do all of the Life S.A.V.E.R.S in the time you have in the morning? If not, Hal Elrod even devised a way for you to complete all of them in six minutes! One minute for each activity and they can be in any order you want. As you can see with this type of schedule, I don’t have time to meditate so I move it to before bedtime which sometimes I even forget or fail to do so because I just need to go to bed. Nor do I have time to journal so that is also moved to the ‘nighttime routine’ However, there are days when I don’t go to the gym so I have to do most of the SAVERS. Nevertheless, when I make time for myself first thing in the morning and start on a positive note, it sharpens my mental and physical capacity so I can handle whatever the day throws at me. I truly believe when YOU WIN THE MORNING, YOU WIN THE DAY. Do you feel it’s important to have a morning routine similar to Hal Elrod’s Miracle Morning? Which one of the SAVERS do you think will make a big difference to you? Interesting book! I’ve never been a morning person but I’d like to start transforming into one, and this may be just the system I need. Exercise would be the easiest thing for me to add. I would love a more intentional morning routine. I sometimes get ambitious but usually fail due to the siren song of extra sleep. Some days I would trade almost ANYTHING for extra sleep. How do you stick to the commitment? I think once I started to feel the benefits of having a morning routine, the more I wanted to stick with it. Getting enough sleep is important of course, so part of it is to make sure you are in bed early enough but also have great quality sleep. This looks like such a great book! I am definitely NOT a morning person, but the days that I do wake up early and get my day started well before the kids wake up, are such great days! It really makes such a difference!